Dayang Sumbi is originally a character from the legend of Mount Tangkuban Perahu. She is the mother of Sangkuriang and wife of Tumang. 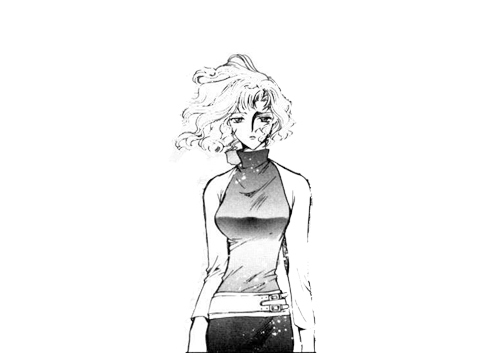 However the visual used for her is from Clamp's X 1999, a character named Karen Kasumi. She is one of the Seven Seals protecting the earth, a fire controller and a Christian. Despite so, her occupation is a call girl. Her relationship with her mother was terribly tragic and it echoes throughout the manga. She believes that nobody will cry for her when she is dead, which is proven wrong by her peers. In one of the chapter in the manga, she also shows motherly characteristic, despite having a traumatic childhood. Unfortunately, she dies during one of the battle, protecting her secret beau. In the adaptation towards Masculine War, she is a mysterious woman living in a chapel on Queen Crater of Mount Tangkuban Perahu. Located up north within the Whiteland, she lives with Paul, a teddy bear with runemastering skill. She reminds Tumang for Jeane, the mysterious runemistress whom Tumang is searching for and his animal sense seems to suggest a possibility of her true form. She grows very fond of both Sangkuriang and Tumang. A couple of months prior to the Masculine War, Mount Tangkuban Perahu shows sign of eruption. At the same time, the chapel is visited by a man by a name of Juraquille. He visits for a short prayer but his alternate motive is apparent. He introduces himself as a Phoellic. He gains information of a potential eruption and since Phoellic gathers fire aviary spirits, he hopes to find one. Not long after the brief introduction, Tangkuban Perahu explodes. Minor earthquake is felt on the perimeter of the Queen Crater. Both Sangkuriang and Tumang try to convinced her to leave the chapel as soon as possible, but the eruption is what she has been waiting for. As the first few smaller scale explosions occur, the natural heat from the lava reacts positively towards her physique. Before any of the men could do anything, Dayang Sumbi is snatched by another mysterious man. Juraquille recognizes the man as Marlboro, another Phoellic who also aims to get more summons. Nicknamed the Thousandth-Eyes Peacock, Juraquille explains how Marlboro is a rebel of the Phoellic clan. Marlboro is in the midst of forcing Dayang Sumbi to be his but he is interrupted by the four men. Juraquille exposes his summon of the Nightmare Hawk while Sangkuriang, Tumang and Paul support. The team manages to push Marlboro away, also with the help of Dayang Sumbi. She apologizes for not being honest about her identity, in which Paul seems to be aware of. She explains that the power of a Phoellic's summon is greater when the creature grants it upon itself instead of being forced out of it. At his time, Dayang Sumbi gives Tumang her Charm Rune before turning into the White Crane and merges with Sangkuriang. Juraquille asks Sangkuriang to join him towards the Phoellic clan but he refuses. Sangkuriang together with Tumang and Paul stays behind and Juraquille leaves. The three meet him together with the Phoellic clan again during the Masculine War.